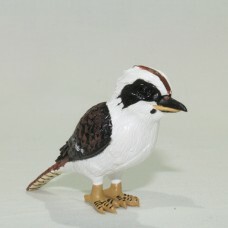 Small replica model of a Kookaburra - Lifelike figurine. Dingo Replica Model - Lifelike figurine. Small - approx 6cm long x 4 cm high Material: plastic Wa..
Small replica model of a Koala - Lifelike figurineMaterial: PVC Size: approx. 3.5 cm long x 5 c..
Bilby Replica Model - Lifelike figurine Small - approx 6cm long x 3.5 cm highMaterial: PVCWarni..
Small replica model of a Numbat - Life like figurine. Material: PVC Size: approx. 5 cm lo..
Frilled Lizard Replica Model - Lifelike figurine. Authenticated by Melbourne Museum.Small - approx 1..
Bilby Replica Model - Lifelike figurine Large - approx 7.5 cm long x 4.5 cm high x 3 cm wideMat..